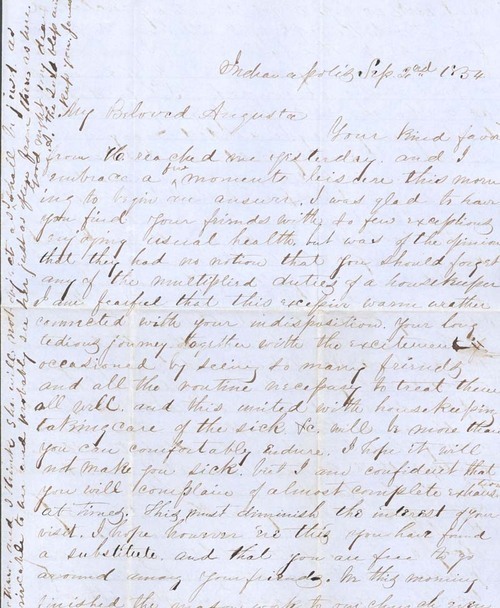 James Griffing wrote from Indianapolis, Indiana, to his fiancee, J. Augusta Goodrich, in Owego, New York. Griffing, a Methodist minister, stated his plans to go to "Nebraska," and speculated that the "surplus population" in the eastern United States likely would lead to rapid settlement of the territory. Griffing expressed excitement about going to Kansas, but warned his fiancee that he would face hardships there.